I love reading and watching dystopian stories about what happens to humanity after a global apocalypse. From Mad Max to Octavia Butler's Parable of the Sower, and from The Walking Dead to Stephen King's The Stand, I love the creative ideas behind the post-apocalyptic quest for survival in literature and film. But there are many people out there who do more than just enjoy stories about surviving an apocalypse. For these preppers, planning for how and where they will "bug out" on the day the stuff hits the fan is an important part of planning for their futures. The problem is that preparing for a coming global apocalypse is not cheap. 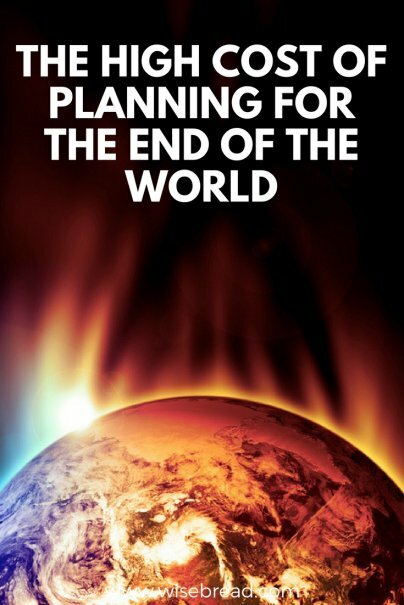 Getting ready for the end of the world as we know it costs a pretty penny — which can cause major financial problems if the nuclear annihilation, newly-risen zombies, and/or cataclysmic comet never actually arrive. Here's how much planning for the end of the world could cost you — and why it might make sense to plan for a more optimistic future instead. Underground bunkers are a staple of apocalyptic fiction for a reason — they offer protection from many different kinds of doomsday scenarios. At the low end, it is possible to DIY a bunker out of a $1,500 shipping container, but even that inexpensive option can get spendy pretty quickly. You have to add the cost of reinforcing the container's sides (since these containers are not built to withstand the weight of soil), plus the cost of installation, which includes hiring an excavator and building a staircase and exit. All together, you can expect to spend between $3,000 and $6,000 on your shipping container bunker, which you still have not set up for comfortable habitation. Adding fresh water, an energy source, waste management, and sufficient food for your long wait for normality to return will add even more money and time to this "inexpensive" option for prepping. At the other end of the spectrum, you can purchase an underground luxury apartment in an abandoned missile silo for between $1.5 and $4.5 million. This will allow you and your fellow 1 percenters to wait out the worst of the post-apocalyptic unrest without having to deal with pesky radiation poisoning or the hoi polloi. These kinds of luxury bunkers come pre-equipped with food, power, and even amenities like swimming pools. Whether you are digging up the backyard to install a shipping container while filing your swimming pool with tilapia, or you are throwing money at the potential end-of-the-world problem by buying real estate in a luxury bunker, it's important to ask yourself if you're preparing for the right kind of catastrophe. There is absolutely nothing wrong with preparing for the worst — but it's important to remember that some future problems are far more likely than others. The possibility that you will not have enough money for retirement is much higher than the possibility that there will be a nuclear strike in your neighborhood. The nuclear strike (or volcanic eruption, or civil war, or walking corpses) may be more interesting to think about — and therefore more likely to end up in a movie or novel — but it's much more likely that you'll run out of cash in retirement and be stuck eating ketchup sandwiches. This is especially true if you invest your money in end-of-the-world preparation, rather than invest it in your retirement. While you are spending money on underground lairs, water purifiers, MREs, radiation-resistant clothing, and enough axes to behead every zombie in a 10-mile radius, you are not building your financial bunker against the vagaries of job loss and old age — and you've purchased items that are difficult to resell, to boot. While it is entirely possible that we may experience some sort of extinction-level event in our lifetimes, there is absolutely no way to know if it will happen — and what form it would take if it does.